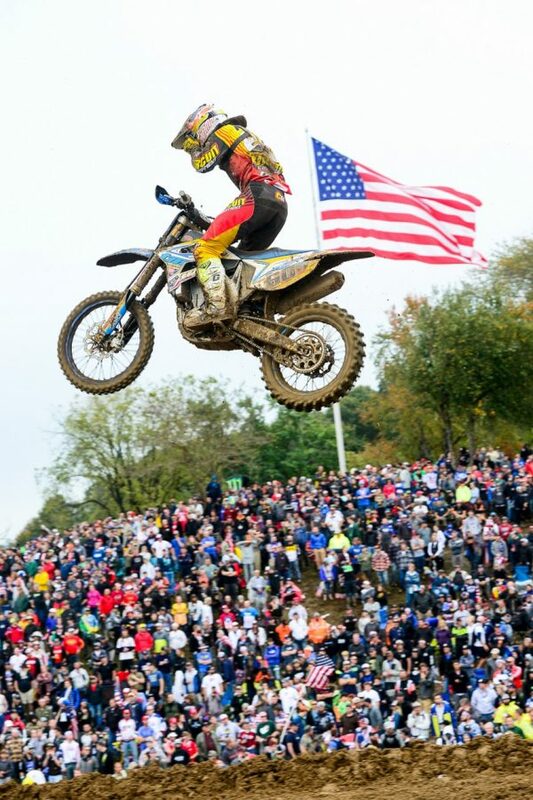 The ‘world’ season ends in the United States with the Nations Trophy and the TM Factory team is competing with Max Nagl riding for the German team. Bad weather has made the Red Bud track even more insidious and difficult than was expected. Max is still not 100% in his physical conditioning after the hand injury, but he has put all his talent and skill to use on the track. Nagl, in the free practice, was at ease on the American mud and managed to find the right feeling with the circuit and conditions immediately. At the start of the ‘Open’ heats qualifier , Max is like a lightning bolt, out of the gate and taking the hole-shot. Thanks to his excellent result, and those of his companions, the German national team qualify in fourth place. In Sunday’s main event races, Nagl took to the track in race 2 together with his partner from the MX2 class. As the gate dropped the MX 450Fi ES-4S hooked up and Max staged another great start, immediately taking the top positions. Unfortunately in the first lap he has stumbled into a small fall that saw him transiting back into 36th position. Nagl did not lose heart, with a great comeback he closed the eighth place, setting top three lap times. In the third and final heats Max gave a literally, spectacular performance. After another great start he sits in sixth place, in the first half of the race he manages to score several more positions to grab the third place. Max tried to push to try and close the gap to the leaders. Because of his physical condition, he is not yet at the top of his game and he made a mistake that costs him some positions. Max ends his race in eighth place. This closes a season where the TM Factory team and Max Nagl have finihsed off with this great result, showing the incredible development work done throughout 2018.